This is a re-post from last October with a few changes to make for better puree. Here is one way to do it. Worked well for me. Scoop out the seeds from the center with a spoon and reserve them in order to make yummy roasted pumpkin seeds later. Put the cookie sheets into the preheated oven. I put a little water in the pan, but wait until they are already in the oven to do this otherwise you’ll have a mess. Roast for 45 min-1 hour or until the flesh is VERY fork tender and the skin has begun to bubble up. TIP: If after an hour the skin still has not bubbled, turn the broiler on for a few min and keep an eye on them, just as the skin begins to bubble up and brown turn it off and take ’em out. Also check every 15-20 min or so to see if the pans need more water. After cooked, take out, cool completely until cool enough to handle. Using a spoon, scoop the pumpkin flesh out of the skin or shave/peel the skin away. Put the flesh in a large mixing bowl or soup pot to reserve while doing the next step. 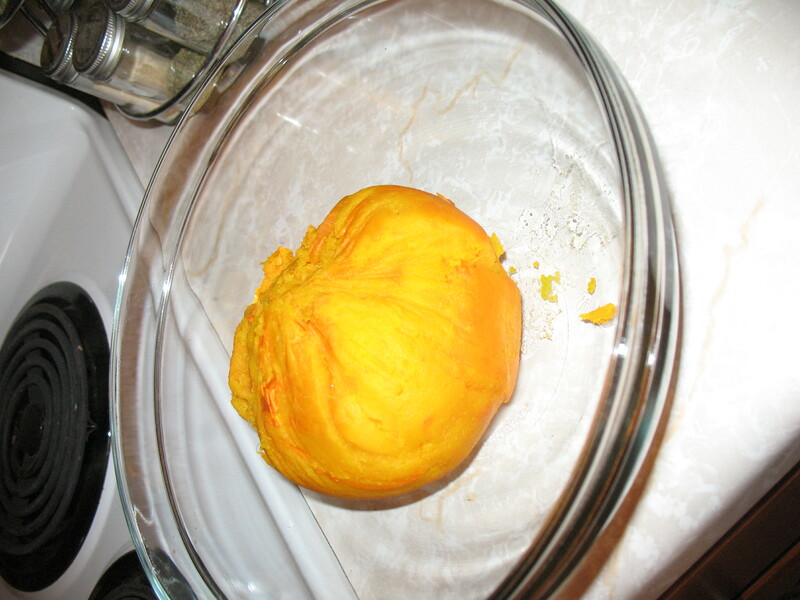 Cut the pumpkin into large chunks and place in the center of a clean dish cloth. Wring out the excess liquid (reserving a cup or so to add as needed for pureeing). You will be left with a pretty dense ball of roasted pumpkin. Break out your trusty blender and puree that pumpkin in batches as big as your blender can handle added the reserved pumpkin liquid as needed. Puree until smooth.